There are some ingredients that are just so good on their own, I almost can’t bear to use them in a recipe – and blue cheese is one of them! Though I’m more into the creamy, gooey varieties – perhaps an nice crumby one won’t be too great a sacrifice! Thanks for the ever-inspiring visuals. I will tell you what gets the most use in our kitchen – a tomato knife. It’s not even an expensive tomato knife. The daughter of a lady I used to work with was selling kitchen utensils as a fundraiser for school. I picked out the knife and a few other items just to be nice- the whole order cost about $20! In addition to tomatoes, it’s great for cutting soft fruits. I can’t keep it in the drawer. It seems like I’m always having to wash it because we are always using it! Hope you have a good time in New York! This salad and the blue cheese dressing look awesome. I couldn’t live without my kitchen aid mixer but I’m not sure that’s considered a tool…apart from that, I’d have to say I couldn’t live without my whisks then. I love blue cheese dressing btw so thanks for sharing the recipe! I come across this question occasionally and, depending on the time of year or my current mood, I usually have differing answers. Right now my favorite tool is a little ceramic pot from a studio back in Wisconsin that I fill with kosher salt for cooking. It’s so easy to reach over and grab the tiny spoon to add a pinch for seasoning, or dig in there with my hand to grab a lot for boiling pasta water. A kitchen epiphany! My favorite kitchen tool is a whisk. By the way, I love blue cheese too and this recipe looks great! How fun! I think my most-used kitchen tool is a garlic chopper. We love our garlic! I’m going to bookmark this blue cheese recipe. It looks fabulous w/those tomatoes and I’ve never made blue cheese! My locking tongs. My knives and I get along fine, and our pots and pans are lovely. But my tongs are indispensable. They are what I miss the most when I’m cooking away from home. My most prized kitchen tool would is my food processor. Yummy looking salad! I’m going to give this one another shot, since graham seemed to favor in me with your last giveaway ;) I often cook and my parents or grandma’s house cause i live in a mini studio. In their kitchens, I LOVE using a zester. I think lemon can find its way into almost anything, and a zester works more efficiently than a standard grater! My KitchenAid is a workhorse, my little wooden juicer has juiced many a lemon, I have my grandmother’s cheese grater and Wusthoff knives, but, I would have to say that my favorite kitchen tool is a book. I love Martha Stewart and Ina Garten is wonderful and I have and use all of her books, but my dogeared mainstay is a 36 year old Better Homes and Garden New Cook Book, which isn’t new any longer, whose pages are falling out, and whose tabs are no more. It is always nearby as it has weights and measures, emergency substitutions, even can sizes and their equivalent measurements on the inside cover and remains my “go to” reference tool in my kitchen. Eeek! So excited for this giveaway. My favorite kitchen tool is a classic– my spatula. It was a gift from my mother from Williams Sonoma and I use it constantly. I have to say I couldn’t live without cookie sheets. They get used all the time, for roasting veggies to baking cookies! Thanks for the recipe and the giveaway! Great creamy blue cheese dressing…so tasty. The kitchen tool I cannot do without? That would have to be a very good chopping knife. I have a very small kitchen and not much space for kitchen knives, so one very good one is all I need. Well..I had to think hard on this one becasue I have so many favorites..but one thing I could not live with out is my wine opener:) I know..some may be saying, “kitchen tool?” I consider it one..and one I could not live without…how else could you get those corks out of the bottles? LOVE your blog…I have tried so many of your recipes!! there’s nothing better than a good set of knives! honestly, I love rubber spatulas. As plain jane as it might sound, they are just so helpful when you’re trying to scrape the last bit of batter or sauce, etc out of the bowl or jar! Oh, I was really tempted to say my dishwasher (because I would not do 1/4 the amount of cooking or baking that I do if I did not have one to help me clean up afterward)but I decided that’s not exactly a kitchen tool! I couldn’t live without my kitchen shears! The bf’s fish filet knife… cheap, but so stinkin’ sharp! I was going to say the kitchenaid, but it seems to be super popular so…i’ll say my rubber spatula…use it all the time. My mouth is seriously about to water here. Oooh it just looks so good! One of my most-used kitchen tools is my garlic press- one that doesn’t require the cloves to be peeled first. Fresh garlic adds flavor to so many dishes that I can’t believe I used to use the pre-chopped jarred variety! I love your blog and recipes! Although I have yet to comment on your blog, I use your recipes all the time! I’m excited to try this one. My favorite kitchen tool is the microplane grater that I received for Christmas last year. I can use it for ginger, cheeses, zesting citrus–just about anything! Have a wonderful time in New York! Dana, your blog is wonderful. Thank you for sharing recipes and your life with us! It is a joy to read. Looks like all the obvious joys of kitchenware have been mentioned so…I LOVE my nutmeg grinder. It is a magical reminder of a great trip to the Caribbean and gathering nutmeg at a botanical garden. I am transported back there every time I use it. I cannot live without my immersion blender. It’s great for making everything from soups to desserts. What a great giveaway! Hmmm. It depends on what I am doing. If I am cooking, I would have to say my tongs. I love them, and after 10 years, they are still going strong. If I am baking, I would have to say my spoonula (is that what they call them?). It’s the standard rubber spatula, but with a bit of a spoon to it. It gets out every last bit of batter! I love my tongs even though a good chinese girl would use chopsticks! Salad Spinner! Goes great with blue cheese! Your pictures, stories and recipes are so inspiring – I’ve made several of your recipes and have loved them! I’d have to say a good old fashioned wooden spoon is the best tool, but I too love my immersion blender. Every time I use it I think – what a cool handy tool and much easier to clean than a blender! My kitchenaid and my little sharp paring knife for cutting apples straight and clean. My favorite kitchen tool?? My first thought was my KitchenAid mixer, but that’s more of an appliance. So,I’d probably say my wooden spoons are my favorite tools. I use them for everything. And I have a bunch of them too…one can never have too many spoons! I love the recipe. And blue cheese on its own, of course, but like you it took a while for me to like it. I love a good knife in the kitchen, as well as my microplane grater. Those two gadgets get the most use out of everything else in my kitchen. I have my moods with blue cheese. It really depends. But there are some really great blue cheese. I can’t live without my chef’s knife. I have an old paring knife that has been sharpened to probably half it’s original size over the years. I love the way it fits in my hand and use it all the time. I love blue cheese, too, on salads, fruit, baked potatoes, steaks, even on toast for breakfast. Thanks for the chance at the giveaway! I would love to win the tools! AND I loooove blue cheese… the good homemade kind. Yum! Hello there, this is my first comment to your blog although I’ve been reading it before. First, the dressing looks delicious. I’ve always LOVED blue cheese dressing (even with McDonalds salads!) so I can’t wait to make my own. That salad looks yummy no matter what you dress it with! I find knives, spoons, a good cast-iron skillet – these are basics that ensure kitchen efficacy, not indispensible tools based upon preference. I am a baker more than a cook, so my nesting glass bowls get a workout regularly. I could survive with a few basic bowls but I use the different sizes for a million things, even an impromtu double boiler. And when you have a tiny apartment kitchen like I do, the space saved by nesting is great! The one kitchen tool I could not live without would have to be my apple slicer. We are always eating apples around here and it is so easy to clice and core one with those! Thanks for the chance to win. Don’t pick me! I have all that good stuff already, and I LOVE the knife, it’s awesome. Besides knives, I cannot live without kitchen tongs. Such a simple thing, and I use them for everything. 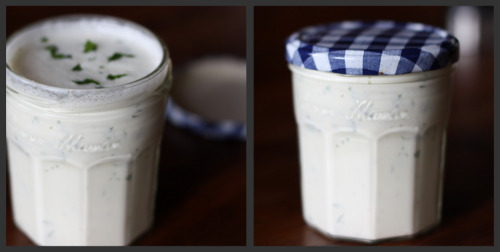 I do love a good blue cheese dressing, but I’ve never made my own! As for the kitchen tool that I couldn’t live without…it would have to be my chef’n silicone spatula. I use it to scrape out bowls and I love it to death. I think it’s because I’m so thrifty that I get such pleasure out of scraping out bowls. Not entering the giveaway (because Duh, I already have the stuff!) but wanted to say that blue cheese dressing is also awesome on beets. Just a little tip from my childhood salad bar lovin ways. I don’t have a fancy kitchen or many tools, not because I wouldn’t love them, but there are other priorities (ages 8 and 11 now). When I heard Greg Atkinson on the radio talking about drying salad in a pillowcase, and how one of his favorite gifts to give is a pair of kitchen tongs, it made me feel better about my circumstances. One doesn’t need a lot. That said, I treasure my old, well-seasoned cast iron skillet. It means Sunday morning pancakes whether we are at home or camping, and someday the kids will probably fight over it. um, the kitchen tool we couldn’t live without? a garlic press. no doubt. My favorite kitchen tool is my Black and Decker electric mini-chopper. I have had it for years and it’s still going strong. I use it for onions, chocolate, nuts; you name it. It’s small and oh so easy to clean. As far as kitchen tools go, it’s probably the mini grater I found that actually fits in a drawer and doesn’t take up much space in the dishwasher. Love that for anything that’s too small to bother getting the food processor all dirty! I can’t live w/o a can opener! Thanks so much for the fabulous giveaway – I would be SO thrilled to win! I absolutely could not live without my stainless steel cheese grater! I can’t live without my $5 stoneware Pfaltzgraff casserole dish I bought at their outlet store probably 12 years ago. My girlfriend and I decided on a whim to take a trip across the border ( We’re Canadians! ) with three children under the age of two! We now live in different parts of the country but I think of her every time I use this dish, and I use it all the time! Miss you Nance! I don’t want to enter since I got the same swag bag as you but I agree – salad dressings are a whole new world when made from scratch. I hated all dressings as a kid. I’ve gradually come around but still prefer homemade vinaigrette or buttermilk ranch. Yum! I could not live without my kitchen shears! I use them for everything from raw meat, to veggies, to cutting dough! I have 2 pairs! The most important kitchen tool to me would have to be a good knife! It’s what I use the most often in my kitchen; with the shears coming in a close second – if not battling for first place with the knife! I love honey mustard dressing too. I’ve never really liked blue cheese on it’s own but blue cheese dressing is always yummy. How nice of you to give all of that away! =) As for the kitchen tool I can’t live without… as odd as it might sound, might be a steak knife. I never eat steak obviously but the knives are always sharp and they’re cheap so I put them in the dishwasher after using them. I always use them if I want to just cut up a piece of fruit or slice a tomato and don’t want to wash a knife! How easy to turn chicken, shrimp and steak with a great pair of tongs. This dressing looks wonderful……….thanks for sharing. Kitchen tool that I can’t live withouth……jalapeno seeder. There are several out there, I have tried them all. This particular one is similiar to a potato peeler, makes for a quick clean to grill or stuff jalapenos! One of my favorite tools is a pastry cutter. It’s great for making delicate biscuits, pie pastry, and fruit crisp toppings! Absolutely, definitely, positively, indispensable to me is not exactly a tool (is that cheating? ): It’s truffle salt. Even a simple dinner of eggs and toast is divine with a little bit sprinkled on top. As for tools I can’t live without… the winner would have to be my salad spinner. Wet salad greens are sad looking and salad dressing slides right off them. This provides a true shortcut for a necessary but otherwise terribly tedious job. my water kettle! it is used all the time. from tea to coffee to par boiling to cleaning up. and it’s just seconds to boiling water. this dressing looks great btw – gonna make it tonight on a salad with apples and walnuts. yum. I couldn’t find a way to leave you my email address so I could receive your blog. Please add me to your list to receive your blog. Got your Blog from STACY SNACKS BLOG.